The national policy discussion around health care reform ignores the big question—“How do we improve the people’s health?”—and concentrates instead on a narrow question: “How do we get people insured?” The debate is couched in language that is designed to exclude people from the discussion, putting the whole issue in the domain of so-called experts and policy-makers. To most people, such terms as “public option,” “single-payer system,” “employer mandate,” and “individual mandate” sound like techno-babble. In addition to the alienation caused by legislators, much of the progressive organizing effort around health care reform has focused on getting people to lobby their legislators in favor of single-payer coverage. But for large numbers of poor and working-class people, working on a legislative campaign is pretty far removed from their efforts for daily survival. Let’s face it, if you’re not really sick, insurance coverage is something you can put off for awhile. And if you’re really poor, you are covered already by Medicaid. Basically, both policy-makers and organizers are missing an opportunity to create a national campaign for real health care. Instead, they’re focusing on small adjustments to a flawed insurance system that excludes millions of people. We need to start by decoding and dissecting the language of the debate. What exactly is meant by “health care reform”? First, it isn’t about health; it’s about medical intervention. And that intervention usually takes place after you get sick from working on an unsafe job or living in a community sited for toxic waste dumping, or where the housing conditions produce mold and mites – and asthma. The biggest determinant of a person’s health is economic. Poverty makes people sick. So does Americanization, and so does racism (see the film Unnatural Causes: Is Inequality Making us Sick? ); it shows how the stress of living in a racist society dampens immune systems and accounts for higher illness and death rates among people of color). Second, health care reform debate isn’t really about “care”; it’s about cost. If we were really to talk about care, we’d be talking about who is doing the caring, in what settings, in what languages, and with what cultural assumptions. We’d be talking about women’s role as unpaid caregivers. Third, it isn’t about reform; it’s about power. There is no doubt that change is needed. But changes that benefit the poor and working people of this country aren’t going to happen by talking logically to our legislators, who also hear from those that wear expensive alligator shoes. The well-organized and wealthy drug, insurance, and hospital industries currently have the power to prevent real change. The decoded topic is not “health care reform.” The topic is how to finance a Western model of medical intervention. But let’s accept the narrow terms of their discussion for a moment. As socialists, we must expose the system-wide character and ideological underpinnings of the struggle between those in favor of a private, market-based insurance system as a way to allocate healthcare resources, and those who want a publicly financed system. In the health care (financing) debate we must challenge four right-wing formulations head on. 1. Taxes: The right has always made taxes out to be a terrible evil. Any talk of tax increase is immediately jumped on as an example of profligate “tax-and-spend liberal Democrats.” Tax cuts are much touted as the salvation of the middle class, a way of putting money “back into the economy.” But as Oliver Wendell Holmes once said, “Taxes are what we pay for civilized society.” A sliding-scale income tax is a way of partially redressing some of the inequities of the capitalist class system, if the money collected is used for social needs and not to subsidize the giant corporations and the already wealthy. Under a single-payer system, private insurance is eliminated and health care costs come out of tax revenues (society recognizes that protecting the health of the public is a public function, not an individual concern. )Yes, we may have to pay more taxes, but the amount of money we spend need not be more: right now, we individually spend huge amounts of our income on premiums, co-payments, and deductibles, and prescription drugs. 3. Rationing and choice: The right claims that a national system would mean health care is “rationed.” What a red herring! For those who are turned away from emergency rooms because they have no insurance, their treatment has been rationed away. In countries that have national health insurance, there is a logical method of deciding how people get prioritized for treatment. You start off with a generalist doctor for ordinary needs and check-ups, and then you get sent up the system if your problems are more severe. Those with the worst problems get first priority, much as happens right now in our ERs—as long as you have some form of insurance! If you have a lot of money, you can’t jump the line as people can in the current system, nor can they demand (as our drug advertisers tell us to do) certain brand-name drugs, or MRIs, or things we may not need. In addition, right now, due to the profit motive, hospitals and doctors over-treat those with insurance. Why have the percentages of people getting MRIs increased? Because every hospital has to have one to compete with the hospital next door, and once bought, they must be used to bring in money. Why have the percentages of Caesarean sections skyrocketed? Have women’s vaginas changed shape? Duh. 4. Socialized medicine: Wow, that’s a scary thought! To most people, socialized anything means not only bureaucracy but also a complete absence of individual choice and autonomy. Instead of being able to “choose” our own doctor, goes this scenario, we will be shuffled into some immense and faceless clinic where no one really cares about our needs. But under our present system, one-quarter of the people have no choice at all about medical care—because they can’t afford it! In fact, the issue of choice is a lot of hype. Most people don’t even know how to choose a medical provider, medicine has become so mystified. Is it their Harvard Medical School degree? Is it someone who speaks your language? Is it someone who has a caring bedside manner? (None of these guarantees a quality doctor.) And if there were real choice, many people would choose holistic therapies, herbal remedies, and less invasive, lower-tech approaches to treatment. But even more to the point, rather than apologizing, we have to reclaim the word “socialize” as a good thing. Whenever you buy ANY kind of insurance, auto, homeowner, etc., it’s about “socializing” or “spreading” the risk. Our fire departments, our military, our water sanitation, our national parks – are socialized, spreading out the risks and the benefits. That’s a good thing. What was the biggest advance in people’s health in the US over its history? Water sanitation, a public health measure. If we were concerned about health, our national budget for public health would be big; right now it’s only 1% of all the dollars we spend in the health sector. As left organizers we espouse the mass line: from the people to the people. But aside from being a catchy Maoist phrase, what does this really mean? It means starting with the immediate problems as people see them, then putting those problems into a systemic context, and strategizing with people to solve those problems. Above all, it means seeing the people as the real experts. An example from some past organizing: Everyone knows that Boston has many wealthy hospitals that provide the finest medical care to rich people from all over the world. Poor people know that they are not welcome in those institutions. By looking closely at these hospitals and asking why they serve so few at so great a cost, and why communities next door to world-famous maternity hospitals have high infant mortality rates (African Americans have three times the infant mortality rate as whites), the people could see from their own experience that competition among hospitals is the problem, not the solution to our medical cost crisis. What people did not know is that the hospitals are tax-exempt – so Boston taxpayers are subsidizing these wealthy giants! In term of “right to the city,” Boston residents of all classes, documented or not, own the hospitals and should certainly have a right to enter and be served. 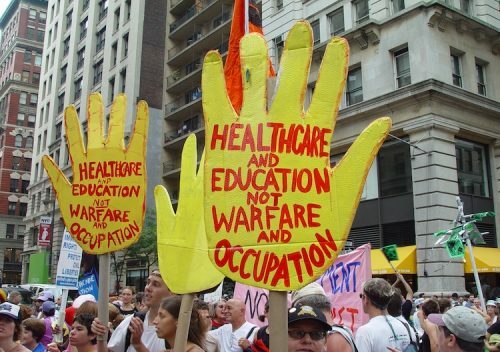 Empowered through activism and a deeper understanding of the system, the people can go going beyond the limited demand of health financing reform and access to an overmedicalized Eurocentric model of health care (I call this the boys and their toys model of health care). In Boston, we insisted that health dollars be pulled out of the medical sector and into community-determined and community-based programs. Community self-determination is a principle that can be applied to any issue. As socialists organizing among the most disenfranchised, we must start from the ground on which the people are standing and take the offensive. We must not accept the terms of the “debate” set from above and bring that to the people. We must bring the voices of the people into the debate and reframe the agenda. We won’t win the fight by limiting ourselves to the terrain chosen by the enemy. We won’t win by using their rules. Guerillas win through winning the hearts and minds of the masses.